Listen. You don't want to tote around a real grenade with you. Even if you're dressed up in the perfect soldier costume and you're going to realism, you still don't want an actual, live grenade with you. Why? Well, for starters, they're very dangerous. They go BOOM! and they destroy everything around them. That means you could be killing it at your costume party and then... oops, the grenade explodes in your pants pocket. Secondly, it's kind of hard to explain to people why you're carrying around a real grenade with you. Most people do NOT find that to be a charming quality to have. It's much better to just carry a toy grenade around, because toys are fun for everyone and they're WAY safer. 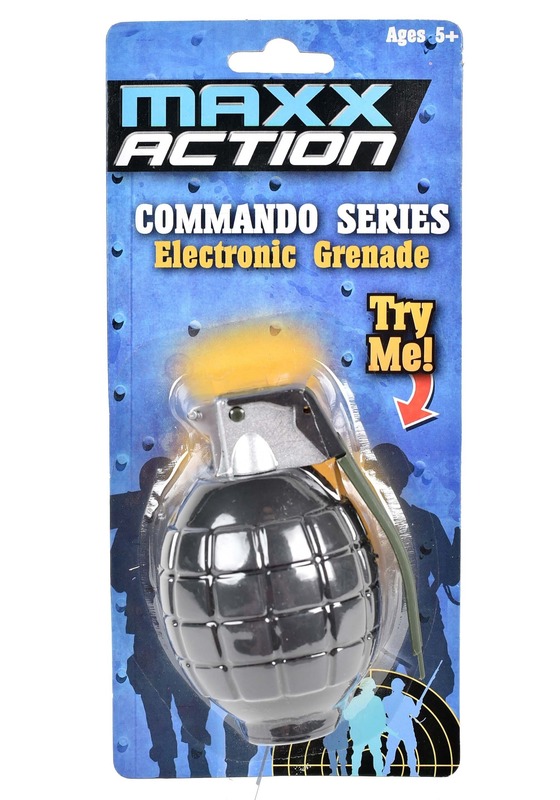 This Maxx Action Commando Series electronic grenade is a toy weapon that adds an authentic style to any military costume. Rest assured, you don't have to worry about this thing exploding. It does make some cool noises though. It makes ticking noises when you pull the pin and press the lever. The exterior is covered in ridging to look like the grenades used by military operatives. Make sure to up your arsenal by checking out all of our military-style toy weapons to put that finishing touch on your soldier costume.